The best part? We're keeping it free. To get your copy now, hit download. Ready to end your struggle for marketing ROI? It's time to generate leads that actually close into business. If we had a pound for every time a prospect told us they wanted to generate more leads, we'd be operating out of the Caribbean. Why not focus on generating leads that close, leads that will actually make a difference to your bottom line? We've spent years helping businesses to generate leads that close so they grow in a predictable, repeatable, scalable way, but we appreciate not everyone is ready or able to partner with us. So we created and published this ebook, outlining everything you need to align your business with your customers and generate sustainable revenue growth. "How to Generate Leads that Close - Volume 1 is an inspiring new approach that will help you turn a prospect into a customer. The best marketing never feels like you are being sold something and that's the secret of this book, it makes you appreciate the human aspect of marketing that is so easily lost in today's digital world where prospects are all too easily reduced to numbers. 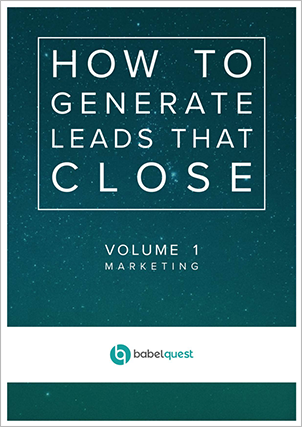 How to Generate Leads that Close - Volume 1 will help you leverage the tools that you already have at your disposal, turning you into a Marketing God. "